Hello and welcome back to another edition of Three Money Methods Traffic Tuesdays. This is Jonathan Kraft and today we’re talking in response to last week’s video where I was talking about traffic. We were talking about all the different traffic methods, if you remember from last week. If you didn’t see the video from last week, I’ve got a link to it right here. All these different methods you know, MySpace, YouTube, Scribd, radio; remember I had all those different things on this side – all the different ways of getting traffic and then we had the webpage in the middle and over here we had the three ways of making money online … selling your stuff. But you still need hosting and you need a domain! The easiest way to switch what you’re doing is to have it all run through something that you control really effectively. In order to do that, you need to have your own hosting account and your own domain. Now here’s the thing, you don’t have to put up any real content there, you can just take the traffic and drive it through a redirect page. A “redirect page” – I’ll show you an example of a redirect here – but all a redirect page is a page you control where the traffic is going and then it just redirects it right along. So for example, last week in the video, I showed my redirect link for domain names. That redirect link was http://www.threemoneymethods.com/ideas/domain. if you remember, that was in the video from last week. Watch what happens when I press “enter” on this or when I click the “go” arrow over here, I want you to watch what happens. I press “go” and it takes me directly to GoDaddy! That is where you will be redirected to if you want to buy a domain. But what just happened in that process is I sent you through a redirect which “cookied” your computer for GoDaddy for me as having referred you to GoDaddy. So if all you were doing was sending people through a redirect, that would still be better than not sending through a redirect — if you’re just sending them right here. Let’s say for whatever reason, GoDaddy decides to shut me off as an affiliate; I don’t know why in the world they would do that, but that happens sometimes. Or GoDaddy decides to turn off their affiliate program. Commission Junction decided to do this, I was sending lots of people to signup for their affiliate program and they decided to stop paying me for sending people to their affiliate program. Now I still recommend you go signup for Commission Junction as an affiliate, but I don’t get paid for that anymore; that link that’s still there — I still drive it to Commission Junction. But let’s say there’s somebody I liked better that I told you that you should go signup for these guys; instead of changing out every link I’ve ever created to this whatever – selling ad space, selling someone else’s stuff or selling your stuff, all I do is change out the redirect! That’s one simple example of why you need to have your own hosting and your own domain. There are a lot of other reasons; one of the primary ones being that you should be building a list of people who are interested in the kinds of things that you have to offer, because it gives you a way to keep offering them more stuff. It’s ten times more effective to re-convert someone who’s bought from you in the past, or someone who knows you from the past, than to try and convert someone new. So you should be collecting names and emails here. There are a hundred other reasons why you should have your own hosting and your own domain; those are just two of the reasons. I think I didn’t explain that well enough last week in the video and so I hope, I hope, I hope, I hope I’ve really driven this point home. You have to have your own hosting; you have to have your own domain. If you want to buy it through my links, great! If you don’t, great! I’d rather you buy it through my links, but if you don’t that’s ok too. Just make sure you get your own hosting, get your own domain and get it done … get it done today! You will have to learn and it will probably be frustrating in the process. But if you get your domain and your hosting through GoDaddy, they have really helpful customer support, and if you buy them through my links, great. Really, they will help you to get this stuff set up. Yes, it will be frustrating; yes, you will have to learn and yes the process is part of the journey and that’s a whole other topic we can get into. Get your own hosting; get your own domain! We’ll see you back next week for another week of Three Money Methods Traffic Tuesday! I promise next week we’re going to talk about this stuff over here. But this point is so important that I devoted two weeks to it. You’ve got to get this stuff done! You’ve got to have your own hosting and domain. You’ve got to be driving traffic through there! So, thank you very much! I’m your host Jonathan Kraft. Come back next week for Three Money Methods Traffic Tuesdays. We’ll look forward to seeing you back here next week. Welcome to the very first edition of Traffic Tuesdays with Three Money Methods. I am your host, Jonathan Kraft, and today we’re going to be talking about traffic! That is what we’re going to be talking about every week with Traffic Tuesdays! Today, talking about traffic, I want to talk not about specific kinds of traffic, although we’re going to get into that a little bit, but I want to talk about the “flow” of traffic. Now, as you read from the Three Money Methods Report, the end goal of your website is to make money! But again, the big goal here is to make money! You can have a passion online but you won’t be able to do it really long unless you have some money coming in from what you’re doing; and ultimately, that’s the goal is to be making some money from what you’re doing. Through user-generated content sites, like Scribd and hub pages; through video sites, like YouTube and Metacafe and Revver; through SEO, which is Search Engine Optimization, getting listed in the natural search results of Google; through image search and a thousand other ways that may come up in the next weeks or months or years as you’re part of Three Money Methods. There’s always going to be a new way to get traffic. We’ll be covering those on an on-going basis through Three Money Methods. But here’s the philosophy and here’s the idea that I want you to think about because it’s really, really, really important. Lots of people are sending traffic directly to someone else’s website. The reason is because if their website goes down, or let’s say for whatever reason, Twitter isn’t working one day – this happened relatively recently. Let’s say Twitter isn’t working one day and suddenly your method of advertising, your method of talking to people is no longer available. 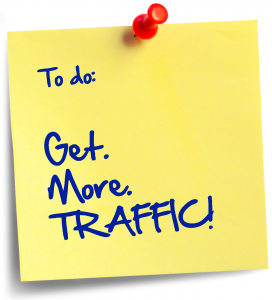 If that were to happen, what would you do – if that was your major source of getting traffic? If that was the only place you could control the traffic? So what I want to talk to you about is a philosophy which says, you have to have some space online that you control. A space where all of your stuff, all of the methods of traffic, go through this space. I’m not talking about a hub page, or a Squidoo page or something like that – you do not control that page. I’m talking about your own hosting account and at the very least, your own domain. I’ve got some recommendations for who I use below the video here and if you sign-up through them, you’ll be signing up through my Affiliate Links and yes, I’ll make a little bit of money on that; and that’s fine if you don’t, go sign-up with somebody else if you don’t sign-up through my links, that’s fine. But the philosophy is you have to control the space! You have to control the traffic! And the way that the traffic is being directed, because if you don’t, let’s say one day, YouTube and Metacafe decide to stop accepting videos – they’ve got enough videos and they don’t accept them anymore; and that’s been your major source of traffic! You’ve been directing traffic directly without sending them through some way to capture their name and email or at least building a brand that people know to come to get you, to get the things that you do. If you do not have a way to control where people are coming through, your business can die in a second! I mean just like that – it can just be gone! So I want to talk to you to make sure that you understand — if you don’t do this it’s ok, but …. it’s really not ok! My recommendation is get a domain and get web hosting set up; you have to control the place that you’re driving the traffic back to. You have to own that domain and you have to have some level of hosting. You can get hosting really cheap, $50 a year. You can get a domain really cheap, $10 a year. That’s an investment that you’ll need to make in your business. And I really, really, really recommend it! We’re going to talk about all these different methods of getting traffic. But really, philosophically, this is huge; get a domain and get hosting set up! Do it this week, don’t wait! Get it done! You then control the flow of the traffic in where the eyeballs go. So if any of these things shut down or if any of these things on this side change, at least you have something in the middle that you control. I’ve been doing business online for eight years; I used to send traffic directly this way – it’s not a good idea for that to be your sole source of stuff! Drive traffic through a page that you control and own. Yes, it will mean you need to learn something. But really, really go do it! Go do it this week, don’t wait. And we will see you next week in the Three Money Methods Traffic Tuesdays which will be coming at you with some awesome free information about how to get free traffic to your website and make more money either by selling your stuff, selling someone else’s stuff or selling ad space. We’ll look forward to seeing you next week back here at Three Money Methods Traffic Tuesdays. What Is The Best WYSIWYG Software? Making Money Online – There are only three ways to make money online.